All my rings go in baggies, so it was only natural to make a baggie ring. 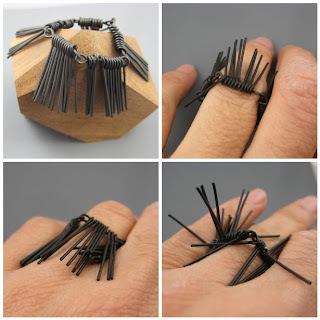 13 major members of the Bauhaus, in ring form. I had this pamphlet from the Bauhaus show at the MoMA staring me in the face from my desk. They just needed to be rings! 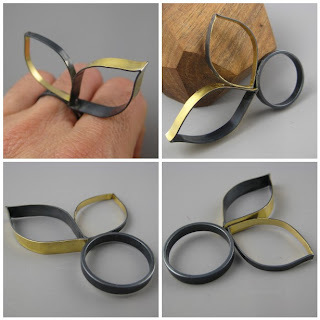 I had made these marquis shapes last week when I was working on the Floating Ellipse ring. I used some bimetal (18k gold on one side and sterling on the other) but it turned out to be too fragile for what I was trying to do. I had to use them for something so they became today's ring. Sterling silver, 18 gold, patina. The challenge this week was to make something with burlap. I ended up having to buy a huge roll of it and this was all I used! This was a really interesting challenge, as I think all of the jewelers were pretty stumped when it came to working with fabric, I know I certainly was. I really loved Mila's dress, so I decided to use that as inspiration. Brooch Sterling silver, copper, burlap, patina. Pretty self explanatory. Pictured with culprit. Masking tape, lint, cat hair. Go to Flickr for more Ring a Day. Last weekend I spent a good deal of time with my Tone Vigeland book looking for inspiration. In some weird way it led me to my Project Runway piece. 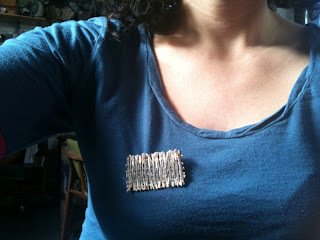 I am still new to the art jewelry world and always learning about new designers. When I learned about her a few years ago she became a real icon for me. I'd have to say she and Betty Cooke are my all time faves. So here's to you Miss Tone! I was a little desperate today. I had started working on this a while ago and it was just sitting on the bench. Just a bunch of scrap. The shank was an old ring reject, the egg shape is from a hydraulic press project that was never really finished and the balls are all links of chain from when i cut it. i had been saving them to use for something. Unfortunately some of the balls fell off and there was not time to fix it. Had to get it up! Was feeling creatively challenged. Just a 5 minute ring made of leftover parts from the cage ring I made a while back. Lazy sunday with a hangover. Had dinner at some friends house and their son Kai really wanted the "dart" from the chicken. Somehow, I got to go home with it. 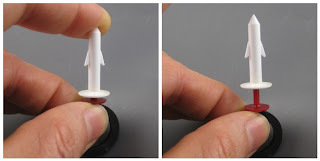 Plastic chicken popper, rubber gasket, Crazy Glue. I'm really happy with this one! It is basically just a continuation of my exploration of elliptical forms. And very hard to photograph. I was working on a ring that I didn't have time to finish, so I just whipped this one up quickly. The gold circle was for something else that didn't work. It was a bit wonky so I gave it a hammered finish for contrast and to hide the wonk. Still needs a polish but its kinda cute. Had a bad day. Ran out of metal, ran out of gas. A bit of a desperate measure. 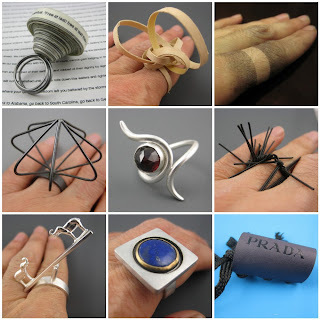 Every season the EtsyMetal team hosts a parallel challenge to Project Runway.The challenge was to do something that represented our own style while incorporating the number or concept of five somehow. Read the details on the EtsyMetal blog. These cage structures are an element I am introducing in my work so i wanted to explore them more here. Each cage has five "arms", for in silver, one in 18k gold. I had originally intended to do the entire necklace of them but I ran out of the 16 gauge wire and I also ran out of gas. Literally. And I just happened to have made five of them! So I ended up creating this asymmetrical look and I am really happy with how it turned out. Oxidized sterling silver, 18k gold. Fabricated. OK I'm just cracking myself up over here today. No studio time, working on the computer all day for the day job. So I just poked through some desk drawers. For some reason I just think this is hilarious! The graphic designer in me could not resist. I had to do a Pantone 365 ring in honor of the length of this project. Sterling silver, pantone chip, resin. More at: Ring a Day Flickr Group. So after, what, 18 days of making a ring a day it hit me.. it is working! I started this because I wanted discipline and inspiration. I wanted the process of creation to become part of my daily life. I wanted it to be easier and more natural. Well, it hit me yesterday that I am no longer struggling with my daily ring ideas. Suddenly, I have a surplus of them. I seem to know what I am going to do each day. I don't necessarily know what the ring is going to look like, but I have an idea of what material I am going to experiment with or what concept I want to explore. From all the wonderful feedback I have gotten from participants and observers I have a feeling the same thing is happening to everyone. Thanks so much to all of you who are participating. It has made it SO much easier for me to do this, and so much more FUN! Here is a collection of my rings over the last 18 days. For more Ring a Day, please check out the Flickr group page. It is Martin Luther King Jr. day and I wanted to do something in honor of the great man. Composed of the entirety of Martin Luther King Jr.'s "I Have a Dream" speech from August 28, 1963. 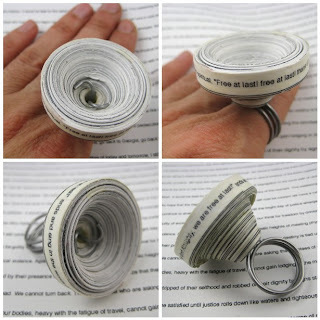 The lines of the speech were cut individually and taped together, spun into a coil, and glued. 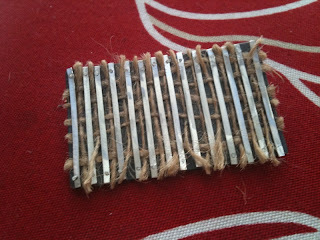 Then attached to aluminum wire. Paper, Wood Glue, Aluminum Wire. I'm very sad to say that my studio mate Martha is going to be leaving us soon. For better things, but we will miss her. She was cleaning out her space the other day and I got some nice veneer from her. I cut a really thing long strip, soaked it in water for a while and attempted to form it into a nice ring. Not exactly the vision I had for it, but it's a ring! Up in the country today and just cooked a great meal, but didn't do a lot of ring making. Sorry about the crappy lighting, but it's all I got tonight! Wood charcoal from wood burning stove on skin. 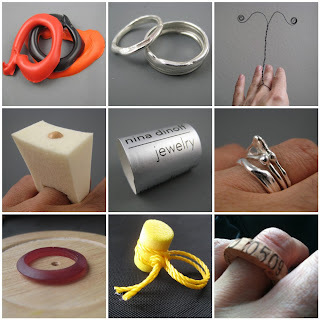 Check out rings from other Ring a Day participants on the Flickr pool. Also check out the new facebook page. 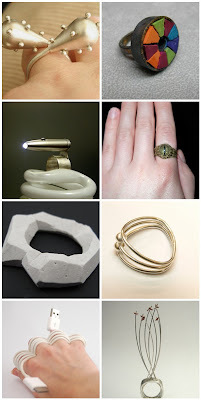 I can't believe how the Ring a Day project has taken off! So many people have thanked me for getting them involved in this and so many other people have commented on how much they are enjoying seeing all the submissions. 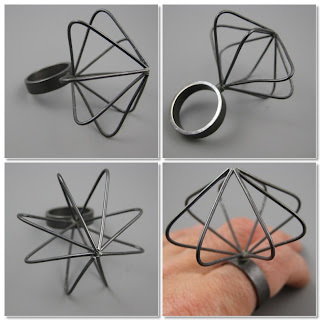 The rings range from the highly conceptual to perfectly executed fine jewelry. All of those seem incredibly inspired and I just hope we can keep it going for the rest of the year. In the midst of all this creative energy and fun, our world has experienced one of it's greatest tragedies due to the earthqauke in Haiti. I am very proud to say that many of our members are going to be donating rings that will be available for auction to raise money to help Haiti out in this incredible time of need. 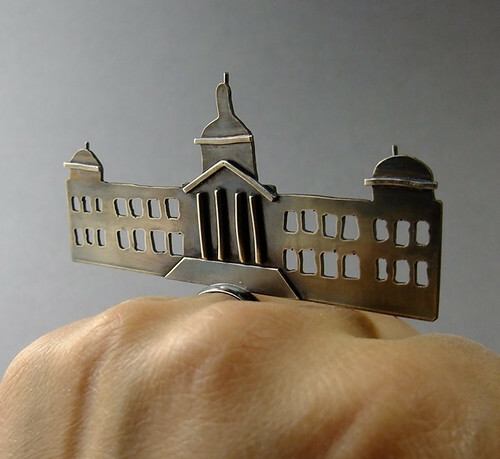 We have Thomasin Durgin and this ring she made as an homage to the people of Haiti. She has gathered about 20 rings thus far and will be auctioning them off in the near future. Stay tuned to her blog (and this one) for the auction information and the name of the charity the money will be donated to. It will definitely be donated to a charity that gives the money directly to Haiti. Thomasin Durgin, 1/13/10 "Ring for Haiti"
There are so many incredible rings it is hard for me to choose, but here are a few of my favorites from the last week. This ring could probably use a better name, but for now I just needed to get it up. I had this garnet sitting around for a while now. I had made the bezel but could't decide what to do with it. So finally, a ring! Sorry, didnt have time to polish it so it is just brass brushed. I will probably polish it up later today. Today I am working from home, no studio. I had these black steel eye pins sitting around, so I just decided to see what the could do. Voila! A hula skirt for my finger. Ring a Day is a success!